MMP4 moving magnet 47k 100pF 43dB standard -92 dB down high grade low noise components An upgrade in quality does not have to deplete your wallet..... 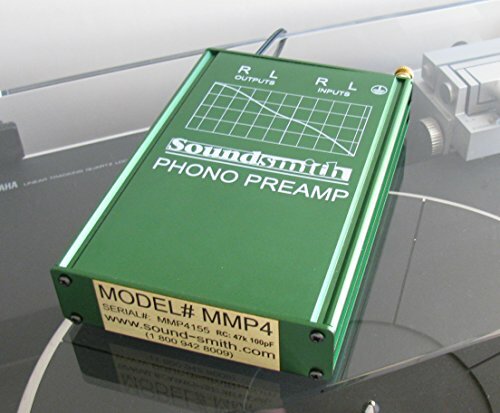 The Soundsmith MMP & MCP preamps are revolutionary designs for their price - and the comments we get at each hi-fi show prove it. These preamps are what we use to demo our cartridges at all our shows even our high end cartridge designs - Each hand - made preamp circuit is housed in a high quality aluminum case, powered by an external DC power supply, with easy to set up instructions. All amplifiers have extremely accurate RIAA equalization response. Our new MCP2 is a low cost way to enjoy your MC cartridge; it is designed with continuously variable loading (10 Ohms to 5K Ohms) to allow use with any MC cart and to tune the high end response for your listening preference. Built-in high quality, fully shielded step up transformers assure noise free and ultra-low distortion to allow unfettered enjoyment from your treasured vinyl collection. The new MCP2 has been favorable demonstrated against preamps costing $3000 - $4000 with surprising results... and compliments to Soundsmith. If you have any questions about this product by SoundSmith, contact us by completing and submitting the form below. If you are looking for a specif part number, please include it with your message.